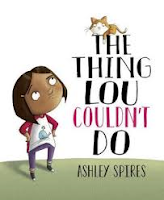 The child in this book thinks carefully about how being sympathetic and kind can have a lasting impact. When Tanisha spills grape juice on her brand new dress, she is heartbroken and runs from the classroom. As the day passes, Tanisha keeps to herself. Our narrator wonders what might be done to show her that she matters. "Should I have handed her my napkin? What does it mean to be kind anyway?" It is a good question to ask ourselves. As a child thinks about it, many things come to mind that would make another person's day better. It is surprising how long the list grows, and how fast. This is a book to help children begin the conversation and generate a list of the many acts of goodness that can be part of our days. It matters in our schools, our communities, and around the world. And, it comes back to us with purpose. The detailed artwork and colorful images provide thoughtful contemplation. The children are as culturally diverse as the ideas for showing kindness. 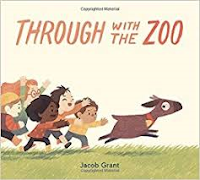 If you are interested in other picture books to inspire kind acts in your homes and classrooms, here is a short list of books you might read. and many more. Aren't we lucky? 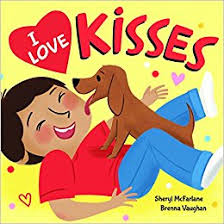 In this lovely little book about a diverse and happy neighborhood, kisses are a thing! Everyone gets and gives them, at all times of the day and any day of the year. Kids and their families, friends and pets are recipients. Joy is expressed on every page, in lilting rhymes and digital images. No matter the family make-up, the diversity that is evident on every page, the kisses are received with joyous expectation and fun. A kiss from someone who loves you is a very special thing. Pucker up, wait for the 'eews' you are sure to hear from some, and then share it again. ... and Snow Mama ... "
Often parents have things to do that take them away from their families. They do the best they can to ensure that young children feel safe and secure, despite their absence. In the first of two 'love'ly books for little ones today, we meet a young penguin named Kipling. Kipling's mother has to leave him behind when she goes on a trip. It is a lonely time, especially as night closes in. Dinner is desolate without her, and bedtime is perfectly dreadful. When she is not home in the morning, Kipling looks for comfort in the familiar. It's not the same without his mama. Days are long, nights are longer. When a 'sad, soggy box' arrives, Kipling is intent on its content. It's from his mama! She knows just what will make him happy. A note accompanies it. Kipling responds in kind, and soon Mama is back! So many hugs and kisses to share. Soft, detailed artwork adds connections for the little listener, and a provide a strong sense of love and warmth. their soft and sweet scent. February is literally around the corner. Three days left in January, and we turn the page to Black History Month, as well as the month associated with love, candy, flowers, valentines and kindness. 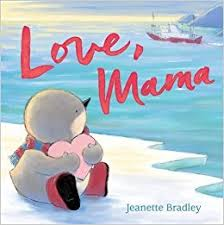 It seems right that we should be sharing books with our kids that exemplify that love and kindness as much as we can. The weather report for Tokyo this year says that cherry blossoms should be in full bloom by April 2. Sharing this book with you now will allow time to have it in your hands before that happens. You might also want to share it if you are talking about moving, about seasonal changes, or about love of family. Sakura's family is set to make a move when her father gets a new job in America. Her grandmother does not move with them. Not only must Sakura leave her comfortable home, she must leave her beloved Obaachan. It is an upheaval, as moving often is for children. She arrives in a place she knows nothing about, where she cannot speak the language, and she's lonely. No cherry blossoms on her street. When she meets Luke, a boy from her neighborhood, things begin to change. sad and still on the front steps. "I find it helps to look up. If you want, I could show you." Using his telescope and sharing his wonder at the sky, Sakura begins to feel better. Helping her friend see what is all around them near the ground makes communication easier. Sakura feels more at home each day. When her grandmother falls ill and the family returns to Japan to be with her, she knows she will miss Luke. Their trip ends in sadness and, once they are home, it is Luke who helps her see that her new home has a special surprise for her that will keep her memories strong and lasting. 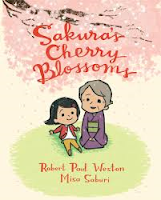 The tanka poems that tell Sakura's story are perfect for showing the changes that life holds for a young girl. From excitement to loneliness, from friendship to grief, and back to warmth and home, this poetic form of carefully chosen and intricately constructed words bring awareness to readers of the depth of emotions one young girl experiences. The illustrations reflect the changes as they occur, and are especially poignant as they show the contrast between the sadness of death and winter, and the brilliance of spring filled with stunning flowering trees, awash with thousands of delicate pink blossoms. If you are a living, breathing human being, you know the power that words have to empower, engage, and uplift, as well as to bruise, batter, and damage each one of us. Words are important, and how we choose to use them should be top of mind at all times. It is not easy to remember that. But, it is worth every effort we make to ensure that our hearts are in the right place when speaking to others. Kate Jane Neal wants her young readers to understand that power, and to use it for good. It turns out that bullying, shaming and name-calling can hurt our hearts, and too many children and adults are feeling the results of that these days. It will take a concentrated effort and a strong dose of kindness to change ways and make the world a better place for every human being. your words can help them feel stronger. your words can help them keep going." It is a concentrated effort that is needed. We all know this; we need everyone to believe it. 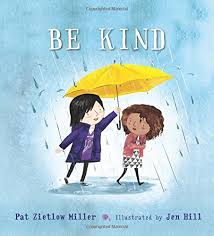 Sharing this book might just make one child think more clearly about kindness. Or maybe many more! Isn't it worth trying? Can we each help make our world a better place? I think so. 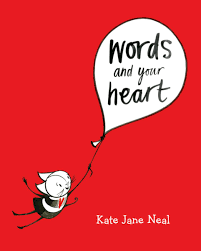 White backgrounds, a red heart, and cheerful, uplifting characters highlight the joy to be found in just the right words and actions. a baby caught the hat. It was a warm hat." I should have shared this before the Women's March last week. I'm sorry. 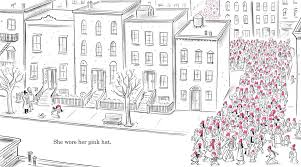 The author draws us into his story with a full page spread, showing a neighborhood where in one building sits an elderly woman looking out the window, while in another a little girl plays her violin. There is no hat. Turn the page to see the woman knitting a lovely pink hat. It acts as hat, tea cozy, toe warmer ... until, the cat gets hold of it. You get the picture. It passes from one place to the next, until the young violinist rescues it. It is in need of a wash. Ready to be worn, it becomes an every day accessory for her. In fact, it's perfect to wear while marching with so many others wearing pink and speaking up for women's rights. 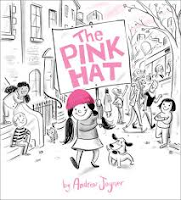 The hot pink knit hat is the bright spot from beginning to end, and pink is the predominant color for the entire book. The rest of the illustrations are done in black and white line drawings that give real emphasis to this symbol of that first march. 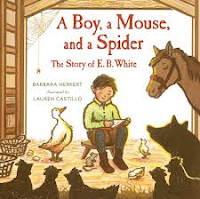 Are you planning on reading Stuart Little or Charlotte's Web to your students, or to your own children? They are such outstanding stories, and will live in their memories for years to come. 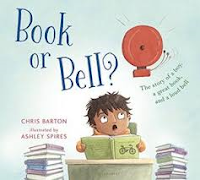 As you prepare for sharing either of those books, you might like to first read this fascinating picture book biography, both for yourself and for your listeners. It is a brilliant introduction to the boy who became the man who wrote those books. E.B. White loved animals from early childhood, befriending a house mouse while he was sick at home and keeping it as a pet. His mother did not know. 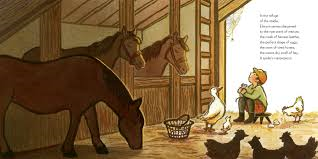 As he grew, he enjoyed the stable animals and the barn where they were housed. He used all of his senses as he explored the natural world that surrounded him. Ms. Herkert is definitely preparing her readers for the shared story. 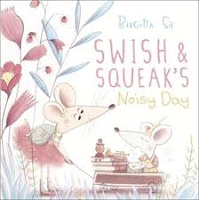 Her well-chosen language and storytelling voice engage readers in this book that begins in childhood, when Elwyn shows an interest in his surroundings and records what he sees and how he feels about it. Writing becomes his passion. At college, he contributes to his school newspaper. A doting uncle at Christmas visits, he tells stories with joy and abandon about a mouse he dreamt of while on a train trip. After working in New York for a number of years and longing for the quiet of farm life, he moves his family to 'his dream in Maine'. Farm life suits him, and from there he writes his three books for children. The polished prose is matched beautifully with Lauren Castillo's gorgeous brown ink and watercolor images. The spreads enhance the text, and provide a clear view of the world so loved by Elwyn as he moves from farm to city and back to the idyllic atmosphere of the White homestead in Maine. They are textured, filled with light and shadow, peace and beauty. You will surely find a favorite ... or two ... or more. I will leave that to you and to your listeners. 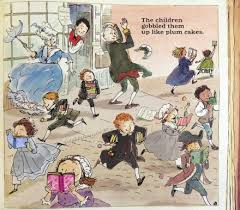 of fairy tales ... "
While we are on the subject of libraries and writers, I thought I would share this book about John Newbery who is widely known as the father of literature for children, and has the Newbery Medal named for him. I did not know his story; as I knew little about Andrew Carnegie. We are blessed to have authors willing to do the research and present us with engaging and important stories about people who deserve our attention. Be glad it's not 1726." Turn the page and get the fun started. In a spirited and refreshing tale, she keeps the children John wanted to reach front of mind. She takes us to the city of London, where John found himself in the midst of those who bought and sold books. His store was designed to attract parents and their children. But, he wanted the books for kids to be worthy of their attention. He was concerned about their parents, and how they felt about that. He did not agree, and set out to prove it. Honing in on an idea to put a book and a toy together for one price, he captures the attention of those important to him. Nancy Carpenter uses pen and ink and digital media to create energetic illustrations to engage readers and enhance their reading. Her edges make it look like a book straight out of Mr. Newbery's publishing house. The details are most welcome and filled with bounce. Sure to please those who share it, this is another biography that deserves our attention. Wait until you get to the last charming scene! Included is further information about John Newbery, a description of the books mentioned in the text, books and articles for further reading, and a selected bibliography. to make her family laugh out loud. 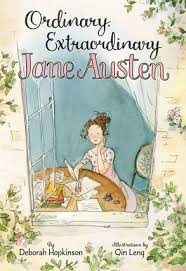 Happy birthday to this book about the much admired Jane Austen. It is being released today! It deals mainly with Jane's early life, and offers a look at a young girl not noticed by many. She was rather shy, and often avoided visitors to the family home by hiding. It proved a boon for an aspiring writer. Jane didn't speak with the guests; rather, she listened to their conversations and garnered a great deal of information from her eavesdropping. Her family also provided gist for her writing. and study at her father's boarding school. full of fascinating (and noisy) characters." Deborah Hopkinson's chatty telling allows her listeners to see clearly how the Austen family lived, and the many joys that inspired Jane's artistic expression. She acted in plays, created costumes and sets, and read, read, read from her father's library. Schooling outside the home was not meant for young ladies of the time. Jane did her own learning. Her father admired her writing and provided notebooks and a writing box, her prized possessions. Jane wanted her books to be different from what was popular. She wanted readers to see themselves in her writing, and wrote stories about real people ... like herself and her family. When her father sent just one manuscript of three to a publisher, it was rejected. She did not give up. Her persistence paid off and she became a published author, although the books did not carry her name. 200 years later, people are still reading those books ... it is quite a triumph! Qin Leng fully matches the easy tone of the story with wonderful ink and watercolor artwork. With changing perspectives, readers see realistic depictions of the Austen family, their home, Jane's joy in writing, and her love of learning. Children listening to her story may not recognize her name; but this is a rewarding glimpse into the early life of a writer they may come to know in later life. Backmatter, includes a timeline, summaries of Austen’s major works, and additional resources. Those who read it to the target audience may just find themselves wanting to know more. That is one of the reasons we share books like this, isn't it? "Andrew went right to work to help support his family. He and his father found jobs at the Anchor Cotton Mills, where giant looms did the very work that Andrew's father had once done at home. Andrew was a bobbin boy, scurrying around the factory floor, removing full bobbins from the machines and replacing them with empty ones. He worked twelve hours a day ... "
I know Andrew Carnegie's name; I did not know his story. 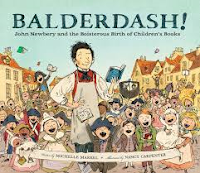 As so often happens when I read a picture book biography, I come away from the reading with more knowledge and a better understanding for people that others consider heroes. His life story is very interesting, as is his legacy. Living in poverty when his father's fine woven linens were no longer viable because of the growing number of mills producing cheaper clothing, the family decided to emigrate from Scotland to America where some family members were already living. Working at any job he could get, Andrew quickly made his presence known. His work ethic strong, his resolve clear, he found time to learn as much as he could. He was very good at the jobs he held, and he knew education was key to a better future. He could not afford the books he wanted to read. Luckily, Colonel Anderson willingly shared his library with those wanting to make their lives better. library. He loved its warmth and light. The more he read, the more he learned." With his growing education and a head full of ideas, Andrew made remarkable progress in his work. Soon he was supporting his family, and using what money he had left to take advantage of investment opportunities. He did not keep the money he made. Instead, he remembered what the colonel's library had meant to him. Today, there are 125 Carnegie libraries in Canada (most in Ontario), more than 1600 in the United States, 650 in the United Kingdom and others scattered around the world. It is a pretty remarkable thing he and his family did. the story clearly in the 19th and early 20th century. The grandeur of the library built in his home village is evident, as is Mr. Carnegie's pleasure at its official opening. Back matter adds context, archival photographs, and a list of sources for further study. I cannot wait to share this with my granddaughters who are 3 and nearing 2. They, too, are noisy and quiet, and it warms my heart to see their love for each other - most of the time at this point. Swish is sometimes annoyed with the noises that emanate from her little sister. She also hears the sounds she herself makes as the two get ready for school, and on their way there. There are so many sounds as the day progresses ... the bell, the growling stomachs, the school band's attempt to play in tune. There is a LOT to hear. When she can't see her sister as school lets out and there are children all around, she is overjoyed to hear Squeak's voice calling our her location. Their trip home offers a quiet visit to the library, and new books to share at bedtime. Listeners will love to hear the many sounds of the day, and readers will have to practice to ensure their success during the telling. The sweet scenes are filled with energy and sound, and done in soft colors to emphasize the feelings between siblings. It has a found a place on my 'keepers' shelf, ready to be shared when Sicily and Chelsea visit again. She is a singer. She is lonely. She is on the lookout for a friend to sing with her. First, she sings in her room and no one responds. When falling leaves begin to slip into the house through an open space, she thinks she might find a response outside. No such luck. She remains alone. Out in the woods, near a pond, she continues singing her solitary song, hoping that there will be a response. She sings to a rock, then to a tree, her song becoming more forceful and plaintive. She does not give up, moving past other flora until she gives in and heads back home. There, she waits through the afternoon until the sunlit sky gives way to the purple haze of evening. She returns to the outdoors, enticed by the darkening skies and finally finding a spot in a beam of moonlight. She sings her song once more. Will the moon sing back? She is heartened by its brilliance and its presence. Nothing. Maybe she needs to be closer. A ladder brings her nearer, and she sings her song again. No response. Her wait seems endless, until dragging her ladder, she heads for home once more. It is a long and tiring time ... but, what is that sound? 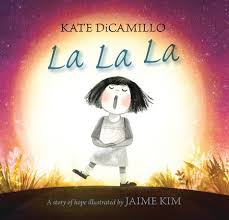 So beautifully designed and filled with hope and love, Kate DiCamillo and Jaime Kim stun their audience with this almost wordless picture book. The simplicity of the song is enhanced by the soft colors of day that give way to the strength and beauty found at dusk, and the emotions expressed by a small girl in each setting. She is brave. She perseveres. She is seen! "The radiator woke Hyacinth the next day, whistling a joyful good morning. Instead of feeling cheered by it like she usually did, Hyacinth felt as if sewing needles were poking around in her stomach. It was Saturday, the official start to Operation Beiderman. Through her window she could see the last wrinkled leaves gripping the branches of the ancient red maple, refusing to drift down to the ground ... "
Meet Isa and Jessie, Oliver, Hyacinth, Laney, Mr. and Mrs Vanderbeeker, Franz, George Washington, Paganini and the other wonderful characters who people their lives. You will not soon forget them, and you will highly anticipate meeting them again in the near future. We can only hope! I read this awesome book last month, and remember every single scene penned by Karina Yan Glaser in her debut novel. 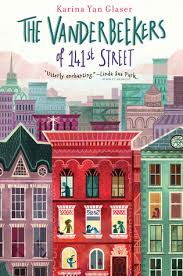 The Vanderbeekers live in a brownstone they love, in an neighborhood they love, and share their days with people they love, the exception being their grumpy landlord, Mr. Beiderman. Christmas is near. Though everyone should be happily anticipating the coming holiday, the family has just learned that their lease will not be renewed, and they need to be out by the end of December. They have no idea why has their landlord has made the decision, and the children are determined to campaign to have him change his mind. The five children all bring their own special expertise to the plan. Each of their attempts is met with the contempt exhibited by Mr. Beiderman. He is a mystery to them as they have never come face to face with him. They cannot comprehend how he can be so mean to a family he doesn't really know. I love every one of the characters; each has a distinctive personality that is well drawn for readers. Their family is engaging, chaotic, full of love for each other and for their neighbors. As they do their best to find out more about their landlord, they make some discoveries that help to explain why he is the way he is, thus turning the tide for each and every one of them. There is so much here to love. 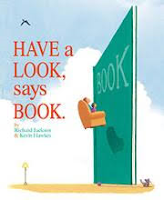 Any middle grade classroom, or student, would welcome the Vanderbeekers into their reading life. You won't want to say farewell, and you will eagerly await news that you might meet them again. "I have always believed that raising kids means more that just being a good parent and trying to do the right things," Papa went on, his voice beginning to wobble. "It means surrounding your kids with amazing people who can bring science experiments and jam cookies, laughter and joy, and beautiful experiences into their lives. From every part of my being, I want to thank you for giving me and my family the gifts of friendship and love." stand up straight ... "
In Will's neighborhood, there is a code: no crying, no snitching and get revenge. So, when his brother Shawn is killed, his path is set for him. Will has never even held a gun. He knows where Shawn keeps his, and he walks out of his apartment, gun in his waistband, on his way to seek revenge on the person he thinks is responsible. The elevator is his means to get down to the street. As the elevator stops on each floor, Will comes face to face with significant people from his life, each a victim of the violence that has taken his brother, and that he is about to commit. The ghosts speaks to Will as the elevator moves from floor to floor. 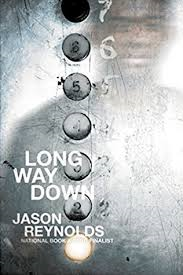 Jason Reynolds uses free verse poems to tell his story; poems that are filled with scenes of violence, powerfully shown through the conversations shared. The trip lasts only one minute, but the emotion, story, and environment are full of impact and thought provoking for Will and for the readers of this remarkable book. The six stops, the friends met, and the stunning effect on Will himself offer a chance for deep discussion and careful thought for those sharing it. I read the book in thirty minutes: its characters, scenes and importance will be in my heart and mind for much, much longer. Please take the time to share the following interviews. They need to be heard. Then, introduce your kids and students to his website where they can learn more about this amazing young writer. Unlike Lou, from yesterday's post, Lulu likes nothing better than climbing trees. 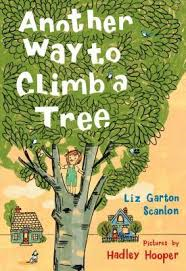 She loves their leafy branches, the joy found in being above the ground, the ways she can help others who are not so keen to climb as she does. She has no fear, despite the dangers inherent in her many ascents. When Lulu is sick and unable to climb, the trees miss her as much as she misses them ... not to mention the other inhabitants who share her lofty perches and those who share the outdoors with her. As she sits inside and watches, she sees that both the sun and moon get to spend the day and night in the tree where she so badly wants to be. It makes her even sadder. She no longer wants to see her tree. So, she turns her back to it. But, the sun has a surprise for her! Lulu only has to use her imagination. What a celebration of Lulu and her trees! Hadley Hooper creates her illustrations using 'traditional art materials and printmaking techniques that were scanned in and assembled in Photoshop'. They are warm and welcoming with leafy greenness enveloping young Lulu every time she climbs a tree. Even her indoor world speaks to her ongoing love of the outside world, and her big window is used to great effect when separating her from it. Lou and her friends are wild with imagination! They imagine themselves all kinds of brave and spunky for the many backyard exploits they dream up. Lou is an active participant. Then, when a nearby tree becomes the ship for a pirate adventure, she wants to take a step back. Lou has never climbed a tree, and she is not in the least bit interested in trying it. Lou is afraid of what might happen. Her friends are adamant; they want her to be part of this new outing. Lou is equally sure that she does not want any part of it. She starts by making excuses for not being able to join them. All are inventive, and slightly suspect. Even the ingenious ways she imagines for getting her up there without climbing are unreasonable. With her friends' faith in her ability to do it and their need for a leader to neutralize an imminent attack, she decides to give it a try. hurricanes, even a super-bad brain freeze. going to CLIMB THIS TREE!" Is she, or is Lou right in thinking that tree climbing is not her forte? Maybe another day, but not today. I know how Lou feels. There were some things, as a child, I was just not willing to try. Tree climbing was one of those. I admit to envying those friends to whom it was no challenge, but it was not my cup of tea. Sometimes being afraid of something is your safest bet for staying safe. Lou did her best, and that is really all anyone can ask. Ashley Spires' band of daredevils are appealing and expressive. They love to be together and their many escapades show the fun they share. Lou's reserve over trying something that elicits genuine fear make her vulnerable and honest. When it comes to helping her friends, she decides it's worthy of an effort, no matter how hard it is on her. Her facial expressions show the emotions she feels from start to finish. hammers, pliers, screwdrivers of all shapes and sizes. repaired toys, and sunglasses, parasols and sun hats. On cloudy days, she fixed toys ... "
Miss Matilda loves her park bench. She spends her days there waiting for children who live in her community to come to her with their broken things. She is a fixer of toys, and a fixer of hearts. While some children bring their toys to be mended. Miss Matilda is a listener, and a very good one. Her large suitcase is with her every time she says goodbye to her canary and its early morning music. Inside there are those things she needs to help the children who make their way to her bench. Hearing Jeremy cry with 'unseen hurt' leads her down a new path ... to a pain that none of her shiny tools can fix. Perhaps a song will help, and a hug. "They stayed that way for a long time. toy, she whispered, "Come back later, dear. Right now, I'm mending a broken heart." Miss Matilda has found another way to help children with what is broken. And, when her heart is broken, she gets a lovely surprise from those beloved children. The artwork for this book was rendered in acrylics, graphite, charcoal and found papers and assembled digitally. 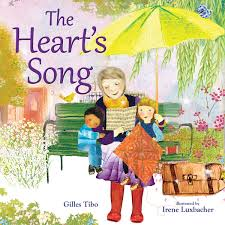 If you have seen other books by Irene Luxbacher, you will not be surprised by her beautiful spreads filled with warmth, love and detail. I have pored over them again and again. So very special! Porcupines are not often the first choice for friendship in the forest. Elmore knows that, first hand. Few of his neighbors have any interest in getting close enough to be a friend. It is the way in Elmore's world. It makes him very sad. He's not sure why they don't like him. He likes them! When he puts up a sign seeking new pals, he learns that he is not 'easy' to be around ... too prickly! He has lived and loved his life in the magnificent maple that offers peace and comfort. Nighttime forays for food are fun, but he is happy to climb his tree when done and enjoys his own company. Not always, it seems. Sometimes he feels decidedly lonely. His uncle has a suggestion when Elmore finds himself wishing he were without quills. "Your quills are quite beautiful. Taking his uncle's advice to heart, Elmore gathers his many dropped quills, packages them, and posts a different sign. What an idea! Holly Hobbie's gentle and affecting images are rendered in warm watercolors. 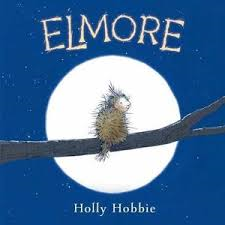 She creates a wondrous atmosphere, and empathy for the lonely, yet competent, Elmore. 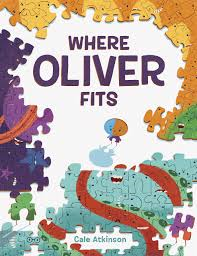 Expressive and charming, this will touch young readers in just the right place. "It was a strange store filled floor to ceiling with curious things. There was an elephant head hanging on a wall, and a suit of armor. There was even a dinosaur bone displayed beneath a fancy glass dome. While his mother and father looked at the dusty knickknacks, Isaac sat down on the cold tile floor and waited." I meant to do this post when I was sharing 'books about books' earlier this week. My mind wandered, I guess! Isaac Gutenberg was extremely lucky. He had parents who loved to read, and who spent their days trying to encourage their young son to take a leap of faith and find a passion for books, too. Isaac was not in the least interested. When they made a trip to the New York Public Library, he was unimpressed and reluctant to go inside. While they read, he moped. Their trip home led them to a store that promised a gift idea for Isaac's Aunt Sadie. They looked, Isaac moped. The shopkeeper shared a story that finally piqued the young boy's interest. "There is a legend," she explained, "that somewhere in the world there is one very special book that's just waiting to be discovered. It will look like any other book, but it holds all the answers to every question ever asked, and when it is opened, it turns to solid gold." 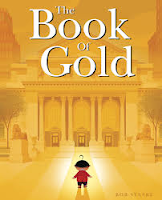 To be fair, Isaac's interest lay in the fact that the book was gold, and might be worth a lot of money! The perfect book at the perfect time is what parents, teachers, and librarians want for our kids. It will take time, and patience, and we might grow tired. Isaac did not, and in time, he found one book, then another, then another - until he was spending his days and nights learning everything he could learn. Isn't that the real beauty to be found in a book? Let's keep passing the shopkeeper's story forward. 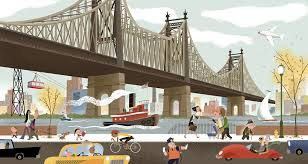 Bob Staake's digital artwork takes us from the past to the present, from New York to India, and on a journey that results in a love of books we hope each child discovers. He moves his readers from the sepia tones of Isaac's reticence to the bold colors of discovery and love for books of all kinds. down and up to ... "
If you are looking to keep kids active on these freezing cold January days, get this book and read it to them! They will be on the go from the time you begin reading until you close it. They are likely to ask you to read it again. 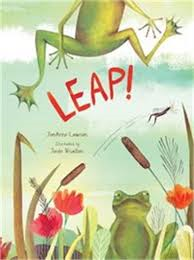 Using poetic prose JonArno Lawson introduces readers to a variety of animals and describes for them the wondrous ways that they make their way from one place to another. His language is lively and creates images that will have kids imagining themselves as adept as the animals being showcased. He has them leap adroitly from one place to another, each time in ways that will entertain and engage his audience. legs stretch long to ... "
And so another animal leaps to the next page! As you might expect Josee Bisaillon's mixed media images are full of movement and detail. Looking carefully, you can see the diagonal lines and soft edges that add context for a young audience. They match the text perfectly. The creatures start out small - a flea let loose from a leaping dog as he welcomes us to the story's start. As we go they get increasingly larger until the frog startles a horse that, in turn, causes that same dog to try to keep up. 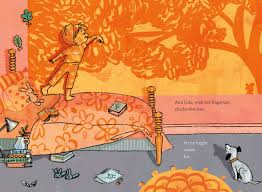 The ending ensures a welcome bedtime tale ... and sleep! And the flea? You will have to see for yourself. their backs, which help ... "
In a book about the amazing world we share, Nicola Davies helps her young readers see there is life everywhere we look. She starts with one, and then moves on to the idea of 'MANY', inviting them to look carefully around them and see the living things that make their home here. 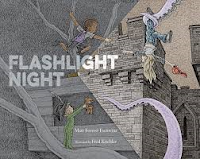 (Candlewick, 2014). She carefully considers her target audience while helping her readers see what lives and thrives in a wide variety of habitats. Emily Sutton ensures they have a clear connection to the earth's many places that sustain this life. Her watercolor spreads are detailed, inviting and filled with diversity. As she has done in previous books, Ms. Davies writes with a clear, conversational tone in one font, adding further relevant facts in an italicized font. That text is surrounded by labeled illustrations of 31 living things that have been discovered in the past 50 years. Further on, in another such spread, we are shown some of the many living things already lost to us - they number 21. She tells readers that life is a complicated pattern; one thing depends on another to sustain it. Humans are part of that whole big pattern, and must do our part. We do not want the 'many' to become just 'one'. 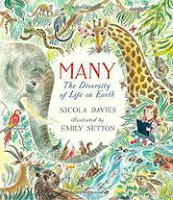 This is perfect fare to introduce young children to science, biodiversity, and the role we all play in maintaining a healthy world. As she does again and again, Ms. Davies ups their interest, adds to their knowledge base, and does so impeccably. "Indigenous people say that Raven, the creator of the rainforest, flew among all the black bears and turned every tenth one white. This was done as a reminder of the last ice age, which ended about twelve thousand years ago." "After turning the bears white, Raven promised they would best fishers on the coast and that they would live in peace and harmony in a forever-green rainforest." Promise kept - so far! 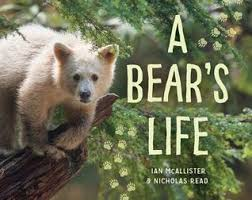 We have talked about the Great Bear Rainforest in other posts ... all by this talented and impressive pair whose glorious nature photography and impeccable research have given us other books to admire and inspire. 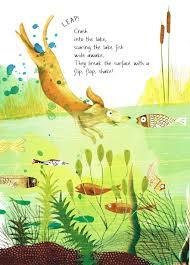 Following Wolf Island (Orca, 2017), this second picture book is perfect for younger readers. This time we follow bears of the rainforest as they move from late winter through to fall. Cubs must be prepared to learn a lot as soon as they emerge in the spring. The older bears know how to take care of themselves, and will now spend time teaching the cubs what they need to know. The text is accessible for young children and offers up all the information needed for them to learn about the bears, their environment, the lessons they are taught, and their food and eating habits. "All bear cubs have to pay close attention to their mothers when they're young, because if they don't, they won't know how to survive as adults. Mother bears start teaching their young the day they leave their dens. They teach them where, when, and how to find food." We are provided with pertinent information about the spirit bear, an amazing sight in the only place such bears live. They live alongside black bears, and grizzlies. No one knows exactly how many bears live there, but protecting their environment ensures their numbers remain high. Fall brings a need for fattening themselves up to survive the winter. The description of their fishing styles is of special interest. "Some plunge their heads into the water and grab the fish in their jaws. Others sit on the river's edge and scoop the fish up like ice cream. Some pin the salmon against the rocks with their long claws. Others jump on top of them and crush them between their elbows and stomach." The photographs are stunning, taken from a variety of perspectives and providing a close look at the bears of the rainforest as they go about doing what they do naturally from the arrival of the young until they are ready to make their dens high in the mountains for a long winter's nap. he could scold them ... "
Foxy obviously loves learning. He is reading Everything About Lemmings, and is fascinated to know that lemmings don't jump off cliffs. As he reads that particular tidbit to his captain, three lemmings hear what they want to hear ... 'jump off'! Overboard they go. Foxy saves them from a freezing watery fate, and gives them a lecture about themselves. They, once again, ignore his counsel and jump off the S.S Cliff! Obviously, they have not read the book. When the jumping happens again and again, with no regard for the danger it evokes, Foxy sets about making amends for their lack of reading skills. A full afternoon's practice teaches them needed literacy lessons; the jumping overboard stops. Will knowing how to read information about themselves affect the choices they make? I think you know the answer to that. In this, their third hilarious book together, Ms. Dyckman and Mr. OHora create another perfect book to read aloud. Listeners will beg to hear it again, and it will not lose its appeal even after repeated readings. They will still be chuckling! Now we know they don't." 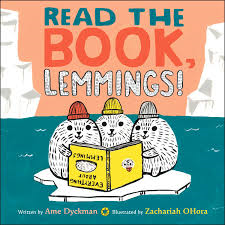 A boat that is a whale, the boat's name is S.S. Cliff, Captain PB is a polar bear who loves fishing and reading the newspaper, his first mate is an arctic fox with a penchant for protection, and the three lemmings are named Jumper, Me Too and Ditto. Geronimo is the lemmings' mantra as they constantly find their way over the side of the ship. The spreads, sporting bold colors, appealing characters, and constant action are a perfect match to the fun the words inspire. The surprise ending is just right! was, "OH. NO! DID ANYONE TELL THE LEMMINGS?!" So, we made this book. You're welcome, lemmings." I trust you are always on the lookout for a baby shower book. What better way to start parents and their newborn on a path to lifetime literacy. The close feeling felt when sitting together to hear the words and see the illustrations, the cadence of a parent's voice, the language development, are all part of the shared experience. The earlier the habit begins, the greater the benefits for the future. This is a book meant to be handled by the babies who will be the recipients of your gift. It has a heavy cover, mirrors at the front and the back, and it is filled with all of the joys and awesome responsibilities of parenthood. There will be bumps, but they will also be many high points. and SHARE OUR ICE CREAM. day and night to make this a better place. while we read this book together." Be sure to put this on your list for any upcoming newborns. Parents will love it! 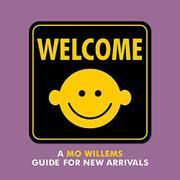 Mo Willems, you have done it again! Just as Henry became consumed by a book in the previous post, a little girl and her papa take flight into a book that is a ride for the senses. The book itself begs a look and a listen, and even an invitation to touch the words it shares. Working in gouache, Kevin Hawkes creates both single and double page spreads that will remind readers of many common experiences - the wetness of mittens, the softness of a mother's touch, the inflexibility of ice, the squish of cooked peas. Sure to conjure sensory memories for those who read it, and stories to share. 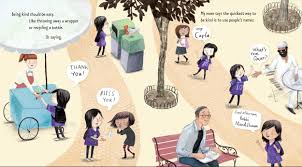 Interesting vocabulary, appealing images, and the book joy felt by a father and daughter make this a winner for lap reading. Dad suggests a break for cocoa and cake in their 'comfy' chair, leading to a leave taking, out through the back cover of the book. The book itself is ever so grateful for their visit. Retirement has brought some remarkable changes in my life. The lack of the dreaded school bell being one of them. No more buzzers letting me know when the workday starts and ends, or when I can take a bathroom break. Since I live across the street from a K-8 school, I can still hear them ... if I really listen! Rarely does that happen anymore. The school bell no longer rules my week days! Though he usually follows the rules, finding a perfect book changes Henry. He is so consumed by its story he can ignore the distractions (including the school bell) that are part of every school day. Why?, you ask. It's because Henry is reading a book that allows him access to another place and time; nothing interrupts his escape from what is going on around him. When he 'stays put' at lunch time, at recess, during P.E, things at school go awry. No one else has ever done what Henry is doing. The adults want to help. The teacher lets the principal know. The mayor makes the suggestion that a bigger bell is all that is needed. That bell affects everyone else - but it doesn't have any effect on Henry. As Henry reads, school life continues its downward spiral with Henry not taking his place in usual activities. In steps the governor, and even a visiting senator to offer solutions that do not work. What's the real solution? Ashley Spires adds her signature humor in 'art created with watercolor, ink and - due to the interference of kitten paws - some digital adjustments' that will garner full attention for all that is happening on this book's pages. As it becomes sillier and sillier, laughs from readers will get louder. I love the chain reactions and they will, too. Cheerful and engaging, this is a terrific read aloud. Three kids, a teddy bear, a sleeping bag, a stack of books to read, a flashlight and the promise of adventure for the anticipated sleepover will have readers fascinated from start to finish. Wherever that light is focused, attention is drawn to exactly that point. So, what is real is right in front of us, or is it? On the path from the house to the nearby tree house, our narrator prepares to tell his story. That story begins, and the children are caught up in the imagined scenes evoked by the beam of the flashlight and the wonder of the imagination. Fence posts become tree trunks, a cat on a fencepost becomes a tiger fleeing into the surrounding woods, and on it goes. A series of rhyming couplets offer up a story replete with an ancient tomb, a country far away, a pirate's treasure, an ocean voyage and a giant sea monster, and a hot air balloon escape. WOW! Every spread captures the contrast between light and dark, created with digitally colored pencil artwork that show what's real in the muted darkness, while the beam exemplifies the power of the imagination in the story being told. Listeners will be fascinated by the fabulous storytelling. In the end, as the three snuggle in to read from the stack of books carried over, a feeling of simple joy is evidenced. The flashlight's beam allows them to go on another fictional adventure in the pages of their book. Then, the light goes out! "With every sniff, a baby elephant samples the air, breathing in the details of an acacia or an aunt. Unlike humans, elephants have poor vision, so a calf "sees" the world around her by following her nose. A bouquet of aromas made of tiny odor molecules travels a few feet up her extra-long nasal cavaties to land on supersized nasal folds ... "
I so eagerly anticipated the publication of Katherine Roy's second book that I worried I might be disappointed. Why? I had been absolutely fascinated by Neighborhood Sharks: Hunting with the Great Whites of California’s Farallon Islands (David Macaulay Studio, 2014). So, when I heard How To Be An Elephant: Growing Up in the African Wild was to be published this past September, I could hardly wait to see it. Thanks to Fernanda at Raincoast, I received a copy. I have had it for a while, and have read it a number of times. I am., in no way, disappointed! I am sorry that I didn't tell you about it sooner. It is a book to savor. 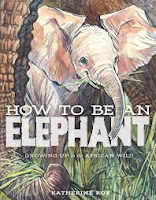 It is an incredible book to share with kids, as it gives a close-up look at how a baby elephant finds its way from complete dependence on the herd to being a mature, contributing member. 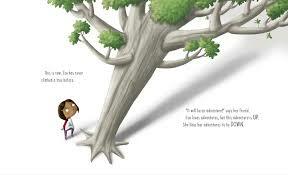 In breathtaking illustrations Ms. Roy provides a clear look at that baby's journey. Her birth is highly anticipated by female members of her herd, and her growth and development are watched over carefully. It is a steep learning curve, but guidance is given every step of the way ... with a perfect family of teachers. The author looks at multiple topics as they pertain to the calf ... birth, family, travel, senses, anatomy, and the process of maturation. It is an intriguing and informative design, and allows readers to see that every member of the herd helps to raise the newcomer. Her stunning and detailed artwork is incredibly appealing. 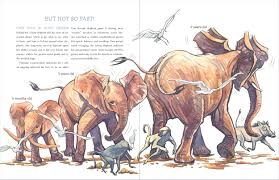 She switches perspective from daily life with the herd to diagrams that show the way an elephant's body works. She leaves nothing out as she chronicles, through scrupulous research and gorgeous art, the many aspects of newborn's life from birth until she is ready to take on all aspects of being a contributing member of her family. What remarkable animals these giant pachyderms are! Their survival in the wild is paramount if we are to continue learning more about them. Back matter includes a note detailing Katherine Roy’s visit to Kenya to learn about elephants and the threats to their existence (with appended map) as well as selected sources, both print and film. marvelous, and - in many ways - so much like us." That lesser folks have dreaded. If you will only let it. The painful grips ... "
Oh. my! If I start sharing some of my favorite poems from this inviting new collection, I will still be sharing them with you TOMORROW. 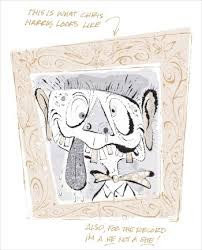 When I was teaching in early years classrooms I had Dennis Lee, Shel Silverstein, and Jack Prelutsky to make my kids giggle and guffaw. 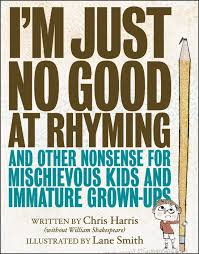 Enter the madcap world of Chris Harris, artfully accompanied by the fantastic Lane Smith. You will be glad you did. Nonsense, yes! But, there is an element of truth to many of the shared ideas. Hasn't every parent longed to follow through on this? "Why should I make my bed?" I said. "It just gets messed up again." My mother said, "I understand,"
And tossed them in the garbage can. "Why should I serve you food?" she said. "You just get hungry again." I really could go on and on. Every turn of the page offers up something else to make readers think and respond, question and enjoy. There are more than one hundred poems here, each enticing and worthy of sharing. 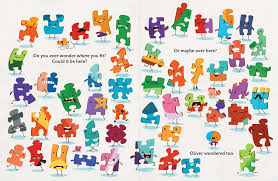 Give this book to partners to read together and they are in for nonstop fun. Kids will love the wild irreverence, the hilarious scenes, the ongoing missing page numbers. Even the dedication is a back and forth between the author and illustrator sure to evoke a smile! "I'm just no good at rhyming. I'm sorry but it's true. And that's why I'm so sad. 'Cause I just can't rhyme words at all." What a superb debut collection of silliness! There are riddles and jokes for the eyes, the ears, and for everyone who ever thought they would love to find a new poet to share at home and in the classroom. Lane Smith brings a strong sense of absurdity in his mixed-media artwork that adds perfect punch to the messages imparted in the words. It's sad that the author is not impressed. "I must confess that I don't like my poems' illustrator. They told me, "Lane is great!" but man, I really think I hate her! I swear that I drew better when I was a second-grader! But I've been smart - for as of now, I haven't even paid her. (I wonder what she'll draw right here? I guess I'll find out later.)" Don't miss the Index which is alphabetized, or the Outdex which includes titles that 'did not make the cut'. The acknowledgements are worthy of reading out loud to anyone willing to listen. Full out energy and fraught with original ideas, this is a collection that deserves a place in every library, classroom and home. Get ready to smile, and smile and smile again! We've all had those days! You know the ones when you just want to be alone, and you need to find a place of solace. For me, it happens when too many days in a week have been too busy. I just need a quiet space to think my own thoughts, to bask in the quiet, to recharge and be ready for another day. Same thing happens for a goat whose 'home' is a petting zoo. He loves it there - most days. A petting zoo is a busy place most days. Parents looking for a place to spend time with their kids; kids looking for something fun and entertaining to do. You know the allure of a place where hugging and petting and grabbing at adorable animals provides just that. Today proves too much for this little fellow. He has a yearning desire to be like other zoo animals that do not have to endure the constant and close attention given the animals that live in his part of the zoo. He wants to retreat to his own private place where he has a chance to breathe on his own, without little hands clinging to him. He wants his own space! Off he goes. He finds other zoo animals that prove clingy, nosy, and attentive to a fault. They want his company, too. It isn't until he stands under a large tree with no other animal in sight that he finally feels peaceful. His place to be alone. No little faces, no little hands, no little hugs." Perfect - or is it? Using charcoal, crayon and digital coloring, Jacob Grant provides the perfect setting to help young readers understand how confining Goat finds the petting zoo pens. Small square illustrations are set in surrounding white space where there is little room for him to move. His view of the zoo beyond widens out and allows for escape, where the wider spreads offer the feeling of freedom he is trying to capture. There is lots of emotion on display here, and it will not be missed by those who share it. We all need space and time on our own, and Goat manages to find it for himself - whenever he needs it. For the rest of the time, he accepts that a hug and connection with others are necessary for a happy, fulfilled life. largest reptile in the world. hundreds of miles from land. weigh as much as 1,500 pounds ... "
Steve Jenkins does it again! In his new Extreme Animals series, he begins with danger. Kids want to know about any animal meant to scare them, and Mr. Jenkins gives them just enough information to satisfy that need to know, as he does every time he sets out to create a new book. The design is exemplary - an intriguing title, a short paragraph of needed facts, a text box showing where in the world the animal in question is found and what it eats, perspective on its size in relation to a human, and one further piece of information. 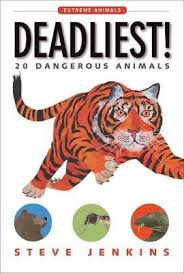 Never overwhelming for its target audience, it also encourages further investigation of the included animals concerning the danger they present. But mosquitoes - wait till you read their death toll! 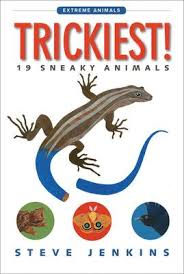 In this companion book, we learn about some of the smartest animals on the planet. Needing to catch food, or keep out of the way of a predator, these animals have adapted to using their own tricks of the trade to fool other animals around them. It is what keeps them alive. They have interesting traits in common ... blending in, setting a trap, even playing dead. The format is the same, the information as intriguing, and the design much appreciated. Because they are found throughout the world, readers will not necessarily be familiar with each one presented. That only ups the wonder of this book. Mr. Jenkins' paper collage artwork will be familiar to fans, and offers carefully detailed illustrations for each animal included. A table of contents prepares readers for what is to come, and back matter includes a two-page review of the 19 animals described and how they are connected by a certain characteristic, a glossary, and a bibliography to show the author's research and to point readers toward further reading. Watch for Stinkiest! and Speediest in the spring! This is a terrific, and much appreciated series.